Location: Château-Chervix, in the Haute-Vienne departement of France (Limousin Region). Notes: Tour de Château-Chervix is former dungeon of a castle located in the municipality of Château-Chervix (Haute-Vienne, France). 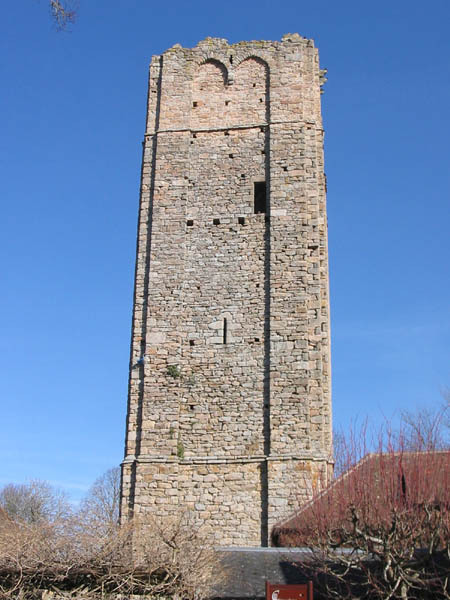 The former dungeon of the twelfth century is the subject of a classification as historical monuments since March 1, 1945.The Tower of Château-Chervix is former dungeon of a castle built by the viscounts of Limoges in the twelfth century. They sent their main prisoners like the castles of Aixe, Nontron and Excideuil. During the fourteenth century, the English seize it twice, in 1356 and in 1380. The second time, they garrisoned until 1381, then leave for a sum of money. In the fifteenth century Gouffier Hermit captain Châlucet, bought the manor of Château-Chervix John V of Britain. His family wanted to redeem soon after, with a right stipulated in the deed, but Gouffier opposed it and it was an order of King Charles VII in 1455 for him to divest. Later, the castle was sold again, then sold in 1487, the lords of Saint Jean-Ligoure, Jean and Antoine de Coignac.